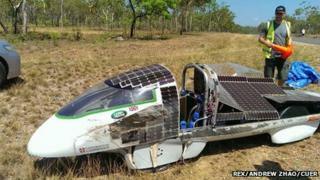 The only British team to qualify for a solar car race in Australia has been forced to pull out after its vehicle crashed just days before the start. 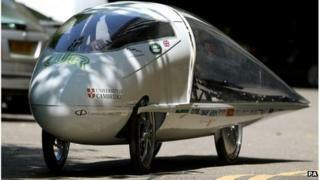 The Cambridge University Eco Racing car, Resolution, was expected to take part in the Bridgestone World Solar Challenge, but crashed on Tuesday. 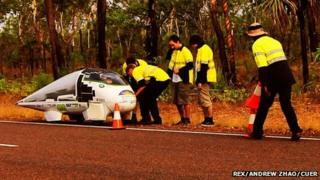 The team hoped to fix it before the start, but withdrew on Saturday. In a statement, the team said: "We have not been able to reassure ourselves of the safety of our solar drivers." Resolution was one of 28 vehicles entered in the Challenger category of the 1,860-mile (3,000km), seven-day race from Darwin to Adelaide which started earlier. Built by a 60-strong team of students at the university's engineering department, the car weighs 265lb (120kg) and is designed to run at an average speed of 50mph (80km/h). During testing prior to the race, the team wrote on their blog: "The first three hours of testing went exactly as planned. "Unfortunately, we also did one unplanned test, of the structural integrity of the chassis. We had an accident." The vehicle rolled on its side, skidded along the road and slipped down an embankment. The driver walked away unhurt as the roll cage and chassis stood up to the impact. However, the team said: "[The] solar cells on the side of the door... do not take kindly to being sanded by 50m of rough tarmac. "Large portions of the side panel cells are now scattered in a thin, very expensive layer over the surface of [the road]." The team added the car was "only designed to withstand one such impact - and as such needs to be repaired to be fit for purpose". Members were unable to make the repairs in time for the start of the race. A message on their website said: "The team is very disappointed but we are confident that we have made the right decision."